A bored wolf pup goes to observe humans during their family holidays, a wedding, or in a park when birds come to eat. 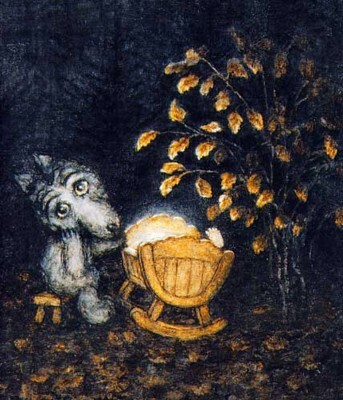 The great Yuri Norstein adapts a popular russian lullaby, as a pretext to relate an avalanche of memories from his own life, transcended into lyrical visions : voted all time best animation film in 1984. Youri Norstein directed this animation masterpiece in 1979. It was shown at the Lille Festival and unfortunately for me, my animated short film “The Merry-go-round” was part of the same screening. It really put me off making animation films. And he was surprised to learn that years before, in the days of the USSR, I had sent him a copy of “Charlie Mensuel” with four pages about his film, that I had not only written, but also illustrated with still photos shot from a 35mm copy lent by the embassy, by inventing a special apparatus, with the help of Bruno Delbonnel, who later became a great camera operator. All this to say that of course Soviet customs had confiscated the magazine copies, so that he only discovered them on that day, and that both of us, somewhat drunk, shed a few tears.